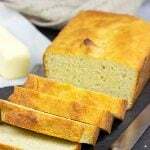 This Almond Flour Bread is an easy, low-carb bread. We loved lightly toasting slices of this bread with a bit of butter and jam! Line a standard loaf pan with parchment paper; set pan aside. Using an electric mixer, whisk the egg whites until soft peaks form (~4-5 minutes on medium speed); set egg whites aside. Using a large mixing bowl, add remaining ingredients (egg yolks, almond flour, baking powder, salt, applesauce, honey and olive oil). Stir until well combined. Bake for 48-50 minutes, or until a toothpick inserted into bread comes out clean. Let bread cool in pan for 10 minutes before transferring to a cooling rack. Let bread cool completely before slicing.